There was a third debate Tuesday night between Mayor Byron Brown, his Democratic challenger Bernie Tolbert, and his Republican opponent Sergio Rodriguez. I don’t see a full video available online, but the challengers took shots at the sitting Mayor, and Byron gave as good he got – especially against Tolbert. 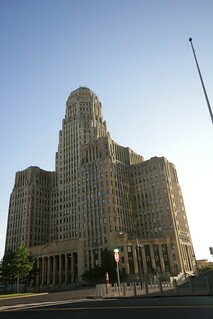 During one exchange, Tolbert said his wife accuses him of being “married” to the city of Buffalo, and Byron retorted that Tolbert must be an “absentee husband”. Rodriguez is energetic and charming – he very effectively gets a one-liner out as his first sentence, and the crowd loves him. (At one point, he echoed President Obama, saying he attributed the successful waterfront to “Mayor Higgins…I mean Congressman Brian Higgins.” Good stuff). I like that more people get to see him during a prime-time debate that’s been broadcast on TV. Brown tried to play an interesting card last night, accusing his opponents of “tearing Buffalo down” when, in fact, they’ve been tearing Mayor Brown down. There were questions about education, with Tolbert and Rodriguez accusing Brown of letting the schools crumble around him, but Brown pointed to a very recent donation of city money to restore music programs as evidence of his engagement. Rodriguez retorted that, with the graduation rate having dropped from 54% to 47%, maybe we don’t need the Mayor’s involvement. Candidates did not support a “full” state takeover of the schools, but didn’t explain what sort of a partial takeover they’d prefer. Rodriguez pointed to Yonkers and New York City as successful examples of mayoral control of schools. Brown’s record on crime was attacked, with Tolbert and Rodriguez pointing out that the numbers don’t really reflect positive change in the crime rate, (see below, e.g.). Brown’s challengers also pointed out the perception of safety and quality of life, insisting that uniformed cops walking a beat in a neighborhood would be a great first step towards actual safety, involved policing, and the perception of safety. Rodriguez noted that the city spent $11 million on police overtime last year, and we could instead hire 200 new cops to walk a beat throughout Buffalo neighborhoods. Eileen Buckley brought up an interesting question – how do we stabilize the West and East sides and halt these demolitions of dilapidated properties. I don’t remember anyone asking that question in front of so wide an audience before. Tolbert said cranes are nice on the waterfront and all, but the city is ignoring the neighborhoods. Rodriguez said we need the city to help bridge the gap between neighborhood activists and developers, and we need to fight for women and minorities to get development jobs. Mayor Brown proudly touts the demolition of 4,700 buildings – I guess an urban prarie is better than dilapidated squalor, but God is it really something to be proud of? 23,000 vacant buildings? Bob McCarthy asked about the NY SAFE gun control act, and Mayor Brown finally stopped fumfering and said that he backed it. He also went out of his way to tell us how many pages it was, and that he read “every bit of it.” What a waste of time. Rodriguez said he agreed with some of it and not with other parts, but criticized the Mayor’s gun buy-backs. Tolbert echoed Rodriguez’s hit on the gun buybacks – that we need to get guns away from criminals, and not use “stunts”. Sergio blew Byron away on the issue of jobs, noting that summer jobs for youth aren’t what anyone’s talking about, and we need real jobs for real families, and Brown can’t say there’s been “progress” when the city’s unemployment rate is at a 20 year high. Brown claimed that donations to his campaign is not a quid pro quo for a City Hall job, but Sergio blew that away, calling it a “cultural fear” that funds his campaign. Tolbert accused the administration of soliciting city employee contributions by taking it directly from their paychecks periodically; he pledged to never solicit donations from developers or employees. Nothing will quite so starkly upset the Buffalo Republican establishment as Sergio Rodriguez’s announcement of his run for Mayor, set to take place at 1pm in Niagara Square. For WNY Republicans, Buffalo is a tool used to suppress the Democratic turnout for countywide candidates; Sergio Rodriguez, for instance, is Stefan Mychajliw’s worst nightmare. Our new county comptroller – who quite literally press releases a new crisis every. single. day. – won last November by a narrow enough margin that the outcome wasn’t formalized until weeks after Election Day. With a proper big-ticket race on the marquee, Mychajliw’s path to a full term becomes hypothetically more difficult. The hypothesis is contingent, of course, on Democrats coming up with a competitive candidate. Whether Rodriguez’s run will gain much traction is an open question. He ran for a seat on the Council before, and he is very active with veterans’ causes. He is a nice guy – too nice for politics, at first glance – but he’s also a Marine, so it would be foolish to put some real toughness past him. The big problems Rodriguez faces are his city-toxic party affiliation and his utter lack of money in the face of Byron Brown’s tsunami of cash. They are possibly insurmountable, unless Rodriguez can get creative with a bespoke party line (the likelihood of the Conservative Party or Independence Party jettisoning Brown is remote), and can raise some serious money, fast. Since he won’t be running in a primary, he’s got until September to get the money situation together in earnest. What is good for the city and region is that Byron Brown will have a challenger in November for the first time since 2005; a challenger who is, significantly, not a mere placeholder. But Rodriguez will have to build his own army from scratch, as it’s doubtful that establishment Republicans will help him canvass, raise money, or collect petition signatures. None of those activities can happen quietly, and the risks of reprisal are real. Rodriguez might conceivably find support among the grassroots / tea party type Republicans, but they’re few, far-between, not based in the city, and too preoccupied with Adolf Cuomo and Josef Obama taking their guns by force. The issues and problems that the city faces are tough and they are plenty, and the city has cursed itself with a mayor who doesn’t really want the job, whose concern for politics far outweighs his concern for policy, whose City Hall is corrupt and dirty, and who has no vision or overriding agenda for any of the social, economic, or development issues facing the city. Take any serious controversy that has come up in the city in the last few years, and you’ll be extraordinarily hard-pressed to remember what the mayor had to say or think about it. Sergio Rodriguez’s announcement is at 1pm at Niagara Square – can he do it? Is he the future of the city? Let’s listen.